This section contains an assortment of war stories from our past newsletters “Contrails”. Brown's B-17 was perhaps the most heavily damaged bomber to return from com­bat. It survived because of an enemy's act of chivalry. December 20, 1943, was a typi­cally cold, overcast winter day in Britain as 2nd Lt. Charles L. Brown's B-17F lined up for takeoff. It was 21-year-old Charlie Brown's first combat mission as an aircraft commander with the 379th Bomb Group, the target an FW-190 factory at Bremen, Germany. He and his crew of Ye Olde Pub were to become partici­pants in an event probably unique at that time in the air war over Europe—a mission that would remain shroud­ed in mystery for many years. The bombers began their 10-minute bomb run at 27,300 feet, the temper­ature: -60°. Flak was heavy and accurate. Before "bombs away," Brown's B-17 took hits that shattered the Plexiglas nose, knocked out the num­ber two engine, damaged number four—which frequently had to be throttled back to prevent over speeding—and caused undetermined damage to the controls. Coming off target, Lieutenant Brown was unable to stay with the formation and became a straggler. Almost immediately, the lone and limping B-17 came under a series of attacks from 12 to 15 Bf-109s and FW-190s that lasted for more than 10 minutes. The number three en­gine was hit and would produce only half power. Oxygen, hydraulic, and electrical systems were damaged, and the controls were only partially responsive. The bomber's 11 defen­sive guns were reduced by the ex­treme cold to only the two top turret guns and one forward-firing nose gun. The tail gunner was killed and all but one of the crew in the rear incapacitated by wounds or exposure to the frigid air. Lieutenant Brown took a bullet fragment in his right shoulder. Charlie Brown figured the only chance of surviving this pitifully un­equal battle was to go on the offen­sive. Each time a wave of attackers approached, he turned into them, trying to disrupt their aim with his remaining firepower. The last thing oxygen-starved Brown remembers was reversing a steep turn, becoming inverted, and looking "up" at the ground. When he regained full con­sciousness, the B-17 was miracu­lously level at less than 1,000 feet. Still partially dazed, Lieutenant Brown began a slow climb with only one engine at full power. With three seriously injured aboard, he rejected bailing out or a crash landing. The alternative was a thin chance of reaching the UK. While nursing the battered bomber toward England, Brown looked out the right window and saw a Bf-109 flying on his wing. The pilot waved, then flew across the B-17's nose and motioned Brown to land in Germany, which the aircraft commander refused to do. Af­ter escorting them for several miles out over the North Sea, the Luftwaffe pilot saluted, rolled over, and disap­peared. Why had he not shot them down? The answer did not emerge for many years. The B-17 did make it across 250 miles of storm-tossed North Sea and landed at Seething near the English coast, home of the 448th Bomb Group, which had not yet flown its first mis­sion. The crew was debriefed on their mission, including the strange encounter with the Bf-109. For unknown reasons, the debriefing was classi­fied "secret" and remained so for many years. Lieutenant Brown went on to complete a combat tour, finish college, accept a regular commis­sion, and serve in the Office of Spe­cial Investigations, with the Joint Chiefs of Staff, and in other Air Force and State Department assignments until his retirement. He now lives in Miami, Fla., where he is founder and president of an energy and environ­mental research center. The image of his strange encoun­ter with the Bf-109 remained firmly embedded in Charlie Brown's memory. In 1986, he began a search for the anonymous pilot. Finally, in 1990, former Oberleutnant Franz Stigler, now living in Canada, responded to a notice published in a newsletter for German fighter pilots. By com­paring time, place, and aircraft markings, it was determined that Stigler was the chivalrous pilot who had allowed Brown's crew to live. Not surprisingly, Brown and Stigler have become close friends. On that December day in 1943, there had been two persuasive rea­sons why Stigler should have shot down the B-17. First, earlier in the day, he had downed two four-engine bombers and needed only one more that day to earn a Knight's Cross. Second, his decision to not finish off the aircraft was a court-martial offense in Nazi Germany and if revealed could have led to his execution. He considered these alternatives while flying formation with the B-17, "the most heavily damaged aircraft I ever saw that was still flying." He could see the wounded aboard and thought, "I cannot kill these half-dead people. It would be like shooting at a para­chute." Franz Stigler's act of chivalry has been justly, though belatedly, honored by several military organizations here and abroad. 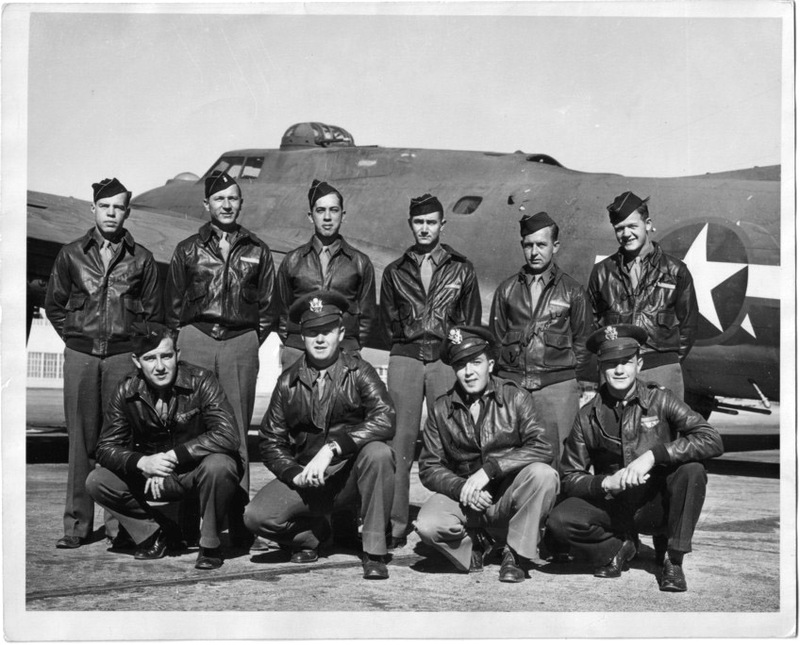 On the other hand, Charles Brown was not decorated for his heroism over Germany, which never was reported by the 448th Bomb Group at Seething to his com­manders. Such are the fortunes of war and its aftermath. In 2007, Charlie submitted a request to the Air Force for the Silver Star Medal for his nine crewmembers of “Ye Olde Pub” for their mission to Bremen, Germany. The citations were awarded in early 2008, and Charlie was awarded the Air Force Cross. No other WWII aircrew has this distinction. 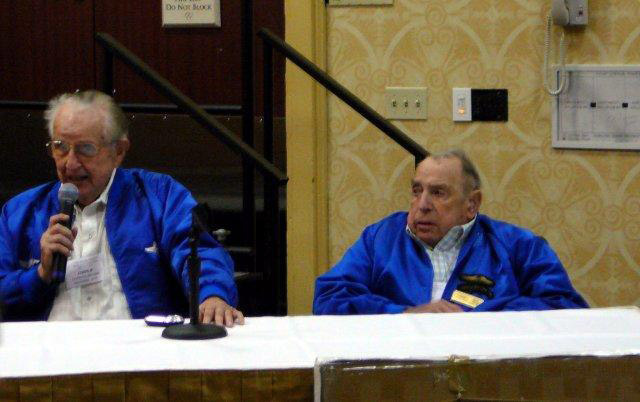 Their appearance together at our Seattle reunion in 2006. Franz, in March, and Charlie, in November.